Santa Fe is 7,000 feet above sea level, so if you rent a bike, you may only have the energy to ride for half a day, but it's worth it. Ride up to Atalaya Trail at St. John’s College above town. 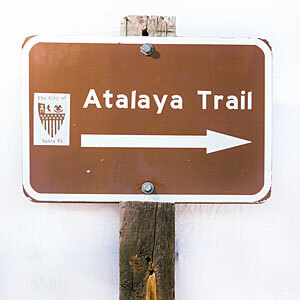 From the trailhead near campus, you can hike up Atalaya Mountain--a 9,000-foot mountain, and it’s only a mile from downtown. You can take the trail partway or all the way up, probably an hour to the top, but you can stop at any point and see incredible views looking back over Santa Fe. Santa Fe is 7,000 feet above sea level, so if you rent a bike, you may only have the energy to ride for half a day, but it’s worth it. Ride up to Atalaya Trail at St. John’s College above town. 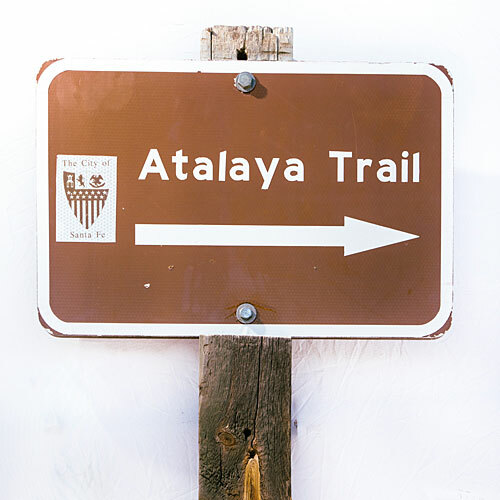 From the trailhead near campus, you can hike up Atalaya Mountain–a 9,000-foot mountain, and it’s only a mile from downtown. You can take the trail partway or all the way up, probably an hour to the top, but you can stop at any point and see incredible views looking back over Santa Fe.